At age 84, John Stobart is still going strong. On Saturday, August 30 there will be a reception in his honor from 5 to 7 p.m. at his gallery at 31 North Summer street in Edgartown. 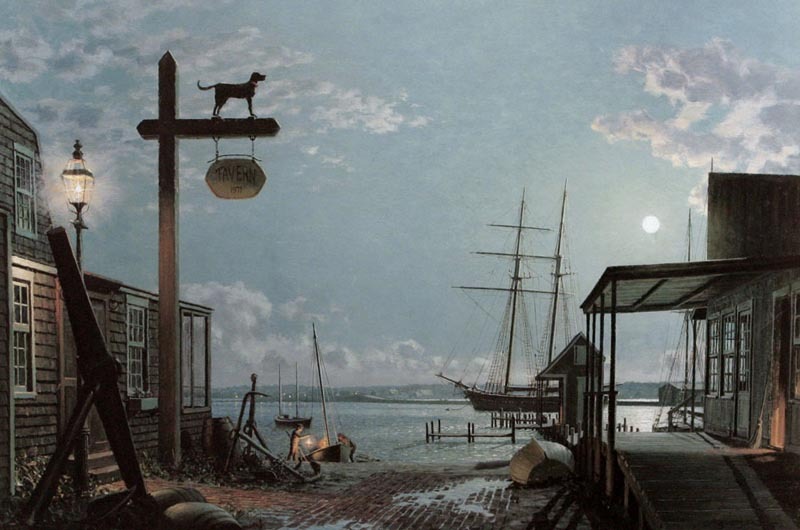 John Stobart went to Nantucket first, but he ended up on Martha’s Vineyard. The expatriate British painter, now 84, was living in Connecticut at the time, and visited friends in Siasconset, on the other island. Mr. Stobart, who has built his painting career on precision-infused oil renderings of maritime scenes, loved the whaling history of Nantucket and its cobblestone streets. But he did not love how long it took to get there, so a friend suggested he try the Vineyard. In 1980, Mr. Stobart built a summer home, which he designed himself, in Cow Bay. Two years later, the Stobart Gallery opened on 31 North Summer street in Edgartown. That building, too, was designed by the artist. In addition to paintings by Mr. Stobart, it currently features works by Audrey Bellinger, Meg Mercier and Kim Shaklee. Mr. Stobart now lives off-Island, but he will attend a reception in his honor at the gallery this Saturday, August 30, from 5 to 7 p.m.
Mr. Stobart describes the Vineyard as a “just unforgettable” place. This is high praise from a man who has visited as many places in a lifetime as most people might see in five. The son of a pharmacist, Mr. Stobart was a talented artist, but a poor student. His father was “full of disdain for what I took up,” Mr. Stobart said, and told young John that art would never put bread on the table. Still, his father secured him a spot in the Derby College of Art. Mr. Stobart flourished there, so much so that he was one of four artists in England to earn a five-year scholarship to London’s Royal Academy Schools. After graduating, Mr. Stobart took an eight-week sea trip around Africa to visit his father, who had moved to Zimbabwe to open a pharmacy there. At each of the 12 ports the ship stopped in, Mr. Stobart created a drawing. Zanzibar, he said, was the most arresting visually, but each stop had its own allure. That allure, Mr. Stobart reasoned, would be a big seller back in England. He approached the shipping company he’d just traveled with, asking for plans for new ships that had yet to be built. Then, using his drawings and the ship blueprints, he made 12 oil paintings of the ship in 12 ports. The paintings were turned into a calendar. “I was able to put that new ship in before it launched, so I made my own business,” Mr. Stobart said. He was 25 at the time. Mr. Stobart estimates that he has made over 1,000 maritime paintings in his career. He visited the great American seaports and riverports, and researched what they had looked like during the 19th century. Steamships were just as captivating as schooners, he said. There are few ports Mr. Stobart hasn’t seen in person — Mobile, Ala., is still left on the list. Now, he is focusing on the whaling industry. “I feel I’ve not done enough on it, and I want to bring it back to life for those who come behind me,” he said. Mr. Stobart went aboard Charles W. Morgan this summer when it was docked in Boston next to the USS Constitution. Most recently, he painted a scene of whaling in the Arctic. Mr. Stobart has never traveled that far north, so instead he based the scene on memories of icebergs he saw while on sea voyages in the Atlantic. The first iceberg he encountered was near Newfoundland, while on an ocean liner trip from Liverpool. “When you’ve seen something like that, something that absolutely incredible, you never forget it,” he said. “The whole point of art is to give pleasure to the viewer, and if that’s all they get, it’s a success,” he added. “But the best thing is that they will get an adrenaline shock when they see it.” The first time that happened to him, he was about 12. The painting wasn’t large, he remembered. It was a watercolor of the hillsides of the Derbyshire dales. There was mist on the hills, and cows were grazing near them. “I looked at it, and I thought, this guy’s got it right, and then I walked away,” Mr. Stobart said. “And then I said, I have to go back and see it.” He got in trouble for being late coming home. Mr. Stobart recalled being knocked out by the genius of John Constable’s pre-painting sketches and by the pure skill evident in a Salvador Dali painting — not a surreal one but a simple one, of a loaf of bread. “The flour was on the bread, the wicker basket was fabulous, it just was a work of art, but it was work of incredible skill,” Mr. Stobart said. His own personal aim, he said, is to keep his own skills at their peak, avoiding all mistakes. And the way to do that is to paint in the moment. “You’ve got to keep your eye on that, on the feeling of it,” he said. Last September, Mr. Stobart revisited Venice, where he created three of his most recent paintings. He was staying in a hotel just south of the Doge’s palace. From the balcony, the view overlooked the entrance to the Grand Canal. He wanted to get it right. Editor's Note: This article has been corrected from an earlier version that misstated Mr. Stobart's age and place of residence. John Stobart is a Maritime artist genius. He is "one of a kind" and his works are authentic and realistic. Looking forward to seeing his new works.